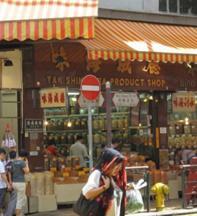 ITS Education Asia Article - WHAT IS THE MARKET STRUCTURE OF THE DRIED SEAFOOD MARKET IN SHEUNG WAN - HONG KONG? 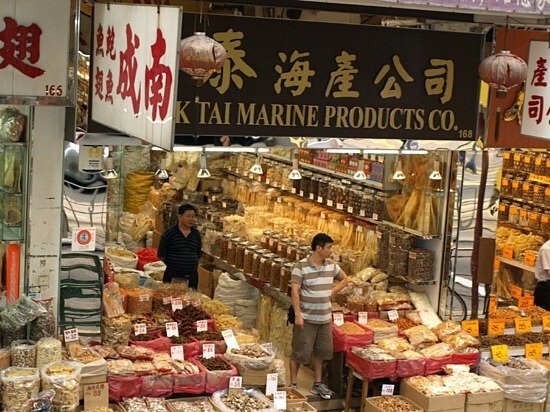 WHAT IS THE MARKET STRUCTURE OF THE DRIED SEAFOOD MARKET IN SHEUNG WAN - HONG KONG? Jeffery was an IB student who sat his exams in May 2011. Jeff received a 45/45 overall grade for his IB. This is the extended essay he did on Dried Seafood Street in Hong Kong. This, in my view, is one of the best extended essays I have seen in that it is possibly the most thorough piece of research ever carried out on this famous street. I would like to thank Jeffery personally for allowing ITS to display this EE on our website. The dried seafood market in Hong Kong has been a well-known local market since the 19th century. There are still more than 300 shops competing everyday. Taking a glimpse of the products, they look identical. This makes one wonder how these firms might be able to compete and survive under such conditions, as well as how customers choose shops. 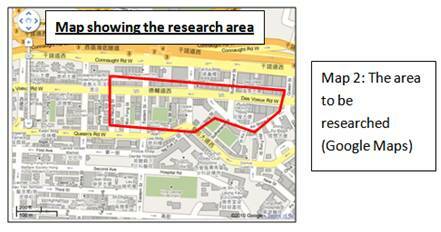 Such thoughts have led to a research question: What is the market structure of the dried seafood market in Sheung Wan? Since the research question focuses on the characteristics of the dried seafood market, a literature review of features of market structures would be done through secondary research so that data acquired from primary research could be analyzed in relation to these features. For primary research, observations and interviews were used. Since there were too many shops to investigate within the whole area, the investigated area was chosen and identified with a map. 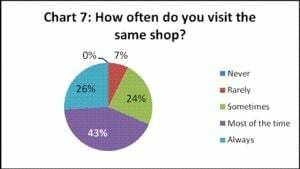 Price survey was conducted by randomly choosing 27 shops in the area to investigate how shops priced the products. Interviews with shop owners were carried out to learn more about competition between firms and potential barriers to entry. Customer surveys were used to see if customer-related features have helped identify the dried seafood market’s structure. Primary data was plotted into charts. Other data and trends on charts observed were commented on and analyzed by referring to the features investigated in secondary research. The investigation showed that even though the market had a large number of firms, the firms mainly rely on non-price competition. Products were proven to be differentiated. Data from price survey and interviews uncovered the existence of price collusion, and barriers to entry were high. Such findings suggested the market was best described to be a case of monopolistic competition with features of an oligopoly. 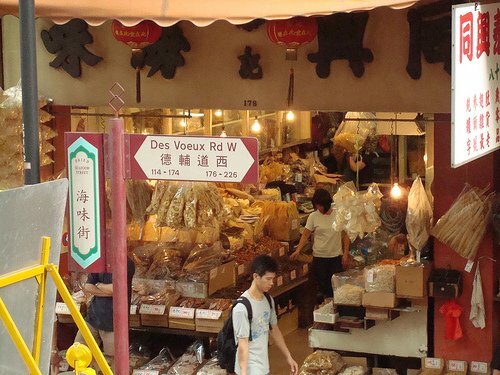 The dried seafood market in Sheung Wan has been famous for selling dried seafood since the 19th century. It is located along Des Voeux Road West and the few streets nearby (red circle on Map 1). In this market, there are around 300 shops selling dried seafood products (Jiangxia, Celine, Jim and Pinghui). These include shark fins, abalone and dried oyster etc. After making a cursory observation of the market, almost all shops sell these products, and they look identical. Why do customers choose a particular shop in the market? Do shops make subnormal (Also known as loss. Happens when total revenue cannot cover total cost.) , normal (Happens when total revenue equals to total cost.) or abnormal profit (Happens when total revenue is larger than total cost.)? This makes one wonder how all shops might be able to survive and stay in business, which makes the topic interesting. These questions lead to a research question to evaluate this topic: What is the market structure of the dried fish market in Sheung Wan? This essay will focus on how the dried seafood shops operate, interact with the customers and survive. The dried fish market will closely resemble a perfectly competitive market(Brief definition would be a market with large number of firms where all sell homogenous products. For detailed definition, see secondary research. )structure as there are 300 shops in such a small area. Customers choose which shop to revisit based on customer loyalty and shops’ reputation, but they would change their purchases if other shops sell the same product at a lower price. The main form of competition on dried fish market is price competition as products seem to be identical. Primary research would be partly done by observation. The number of shops will be counted within this area. Prices of approximately 5 products that are common in most of the shops will be recorded in chosen shops, and 25-30 shops in the area will be chosen. Surveys and interviews will be conducted. 50 customers will be surveyed. They will be randomly chosen. 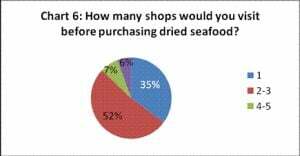 The aim of the survey is to investigate the customers’ particular behaviours while purchasing dried seafood, as well as their reasons for their choice of shop. There will be interviews with at least 3 shop owners. The aim of the interviews is to determine the degree of price and non-price competition, ease of entry/ exit and the profitability of the industry. A wholesaler will be interviewed to ask the wholesale price of the dried seafood products to determine if shops earn much profit by selling dried seafood. Secondary research will be used to backup some of the data found during primary research. In the following section, the characteristics of the four market structures will be researched and the investigation will then see how the dried seafood market shares the features of the market structures. Each firm has no power to influence the industry. All of them sell homogenous products. No barrier to entry and exit. Consumers have perfect knowledge (Consumers are aware of the price changes of goods and services in the market and are price sensitive.). Firms in this industry are price takers. If they raise the price, they will lose customers due to customers’ perfect knowledge. If a firm lowers its price, it would not earn enough profit to stay in business. In the long run, only normal profit can be made. Products are differentiated, so firms can make customers loyal to them. Relatively large number of firms. Each firm holds an insignificant share of the market, which cannot affect the industry. Barriers to entry and exit are very low. Firms do not consider how rivals react when making pricing strategy. There is excess capacity in the industry. They always produce below productive efficiency (Happens when marginal cost equals to average cost). Firms seek customers by advertising or improving service quality. In the library, only a few books mentioned the dried seafood market. Similarly on the Internet, most of the websites were about tourism in the street. Only one online published report was found. The report suggests that the firms heavily depend on non-price competition, such as advertising, to attract customers. Also, the report says that price of dried seafood tended to be a sensitive issue due to high degree of competitiveness (Conover and Dong). These are characteristics of monopolistic competition. The results have suggested that the dried seafood market does not resemble perfect competition. This has led the investigation to ask for opinions from customers and shop owners to see if it matches what the report suggests. Through counting within the area, it could be seen that there are 121 dried seafood shops. The number of firms is quite large. This suggests that the market has a characteristic of perfect competition or monopolistic competition. The photo on the right illustrates the typical size of a dried seafood shop on the street, which is small and approximately 300-400 square feet large. An observation made about the physical size of the shops, which determines how much stock they can have at any one time, suggests that there is no firm dominating the industry even though there might be a chance that a firm owns a few stores. 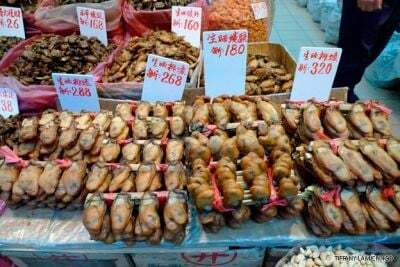 The products sold in different shops on the street, such as dried scallop, abalone and shark fins, look very similar. However, many of the products originate from different countries, such as dried oysters from Japan and Hong Kong. Therefore, the products are differentiated. Product differentiation is a characteristic of monopolistic competition and oligopoly. Data is plotted as bar charts. The x-axis of the charts is numbered from 1-9, which refers to the number on Map 4. For example, A1 is 1 on the map. The 3 bars in different colors represent the 3 different stores in each area. However, some areas might not have 3 bars as some stores might not sell that type of product. Below are the results (Results are in HKD [$] and a unit of dried seafood is measured by catty – a traditional Chinese unit.). 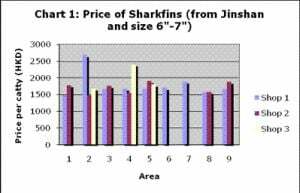 Chart 1: Prices of shark fin are similar in most of the stores. Only two of the stores sell at extraordinary high price, which are $1200 and $920 higher than the lowest price of $1480. On asking the shopkeepers, it is known that the shark fins sold at $2680 and $2400 are of higher quality. 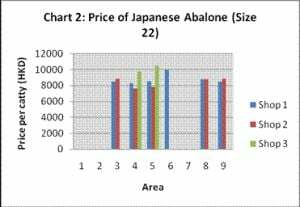 Chart 2 : The price of abalone seems to vary among shops. The lowest price is $7600 while the highest price is $10500, which is a difference of $2900. This might suggest that size 22 Japanese abalone is not an identical product after all. Quality may be an issue because it can be observed that cheaper ones are very dull in color while expensive ones look brighter. 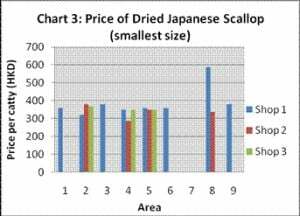 Chart 3 : One store sells dried Japanese scallop at a high price of $588 while one sells at a low price of $285. If these two stores are omitted, then the price of dried scallop is between $320 and $380. On asking the shopkeepers, the dried scallops sold at $588 are a special type of dried scallop. As for the ones priced at $285, the shopkeeper says that they hope to sell more units by lowering the price. 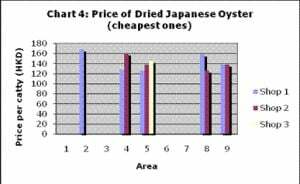 Chart 4 : Only 10 stores sell dried Japanese oyster. Out of these stores, the highest price is $168 while the lowest is $126. The difference is $42. The price of dried Japanese oyster seems to be similar. 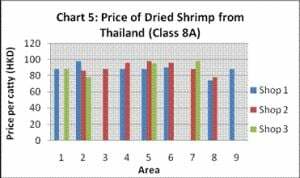 Chart 5 : The price of dried shrimp seems to be similar, except three stores sell them at $78 and $74. If the three stores are omitted, the highest and lowest price would be $98 and $86 respectively, the difference being marginal. By observation, the dried shrimps sold at $74 and $78 might not be fresh as they look dull. It is evident that most of the products are priced similarly in different stores. However, there are products which the price is considerably different in different stores, such as the Japanese abalone. This is due to the fact that abalone is a special and expensive dried seafood product. This can be supported by Mr. Shum who said that price of special products vary (see Appendix B). In addition, price might differ as some stores only sell high quality expensive dried seafood. On the other hand, some shops want to lower the price to clear excess stocks. Nevertheless, the trend shown in the price survey suggests that prices of dried seafood are similar within the area. Such findings also suggest that either firms do not compete on price, or they react to rival’s price changes quickly. In the interview, shop owners were asked about some facts of this industry. Three shop owners were interviewed. The aim of this was to see if some shop owners responded in the same way to the same questions or differently. The responses are organized in Appendix A. Data acquired is from interviews with Mr. Shum, Mr. Chan and Ms. Chan conducted on 23rd June 2010 (See Appendix B). All shop owners said that most of their customers are return customers. This demonstrates that the customers have loyalty towards a shop. Meanwhile, price does not seem to be an important factor influencing customers’ purchases, as Mr. Shum and Ms. Chan claimed that customers were not very sensitive to price. All of these elements suggest that customers’ loyalty exists in the dried seafood market, which is a feature of monopolistic competition and oligopoly. If shops compete, they would aim to produce at allocative efficiency (Achieved when it the maximum combination of goods and services of what consumer actually want ), producing at price Pc and quantity Qc and earning supernormal profit of area C and F. Area A, B and E represents the consumer surplus (Excess of what consumers are willing to pay over what they actually pay). If shops collude, they will behave like a monopoly and maximize industry profit where MR (Marginal revenue) = MC (Marginal cost). So shops can restrict quantity to Qm and raise price to Pm. Supernormal profit increases to area B, C and D (Dobson and Palfreman 104-107). There is a condition that has allowed this collusion to happen. Mr. Shum indicated that ‘many stores have been opened for decades and we [shop owners] know each other quite well’. The firms’ good relationships make price collusion easier to operate. It is also the case that Hong Kong is currently discussing competition laws. An article on this is found and discussed later in the section. Due to collusion, there is little price competition, as suggested by similar pricing in the price survey. Even if firms try to compete on price by setting lower prices, customers may fear that the products might be of lower quality or even fake. This view could be supported by news reported by the Government which a few shop owners were arrested for selling fake abalone at an extremely low price in February 2010 (Hong Kong's information Services Department). Therefore, no shop owner says that lower prices are better although all agree that there is competition in the market. Besides price competition, the interview also focused on non-price competition. While asking about their shops’ unique selling points, all three said they had none. In addition, they had no paid advertisement or promotions. They mentioned that providing good service to gain reputation and customer loyalty was the main form of non-price competition. Mr. Chan and Ms. Chan said that they relied on loyal customers recommending new customers. It is true that it is difficult to distinguish the quality for most of dried seafood by view or smell, unless it is tasted for flavour and texture after cooked. Therefore, customers’ trust in shopkeepers is important. It can be seen how firms would depend on non-price competition for greater sales. This is a characteristic of monopolistic competition and oligopoly. However, as Mr. Shum said, ‘many stores have been open for decades’, it is believed that old customers have been revisiting the shops for years. Old shops tend to have built reputation and a good relationship with customers, so reputation is associated with old shops. Therefore, this causes a large barrier to entry as most new entrants have no reputation at all and customers would hardly trust them. Hence, even though shop owners have indicated that there is barely any government regulation in opening shops, long-term customer loyalty and ineffectiveness of advertising have acted as disincentives for potential entrants. This perhaps explains why, according to the owners, the number of shops has not changed much. Also, this suggests that few shops have exited the market. This allows one to infer that abnormal profits are being made as firms would have fewer incentives to leave the market. Also, since most shops have survived for decades, it is supportive of long term abnormal profit, which is a characteristic of oligopoly. In addition, the shop owners indicated that it would be easy to clear stocks if shops want to leave the market. Hence, there is no sunk cost and no barrier to exit at all, which is a characteristic of perfect competition and monopolistic competition. Such finding contradicts the information provided in the report published by Conover and Dong as they state that the firms in the market compete on price vigorously (Conover and Dong). As shown by an article published in July 2010, the government of Hong Kong is still discussing the law (Clifford Chance). It is expected that the law is not imposed until sometime during 2012 (SJ Berwin's EU & Competition Team). Since there is no competition law, this provides an excellent condition and incentive for the dried seafood shops to collude. The aim of interviewing a wholesaler is to determine the size of the difference in the retail and wholesale prices. This would give a general idea if shops are making abnormal profits or not. Looking at Table 1, the retailers have at least raised the price by 12.5%. On average, the retail prices are 20.1% more expensive than the wholesale prices. Such large difference is perhaps caused by price collusion so that shops could earn more profit. This is why Mr. Chan suggested that this ‘industry is quite profitable’ (See Appendix B). In the long run, abnormal profit may be earned, is a characteristic of oligopoly. Such estimation would be more reliable if the shops’ expenditures are known. However, all shop owners refused to show their financial reports. 54 customers were surveyed in the targeted area. 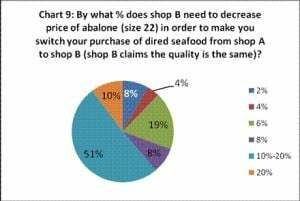 7 questions were designed based on the interview results and asked to determine customers’ habits and the possible cross price elasticity (XED) (The responsiveness of quantity demanded of product A to the change in price of product B) of the more expensive, abalone, and cheaper products, shark fin and dried oyster. During the survey, it could be observed that most of the customers surveyed were older and most of them were around 50-60 years old. It was rare to see young people shopping for dried seafood. Chart 6 : It appears that many people do not shop around for this type of product. This suggests that they tend to be loyal to one or two shops. Chart 7 : 43% of the customers go to the same store for most of the time and 26% of the customers always go to the same store. This suggests that customer loyalty exists, and this, to some extent, gives shops the ability to be a price maker. Chart 8 : 76% of the customers are not very aware of the prices of the dried seafood on the street. It suggests that the customers do not shop for the cheapest price. Such figure suggests that customers do not have perfect knowledge. Chart 9 : Around 50% of the customers choose to switch their purchases to shop B when it decreases the price by 10-20%, which is large. So this suggests that the XED of abalone in different stores is low. This also implies that customers tend to purchase abalone in the shops they trust. 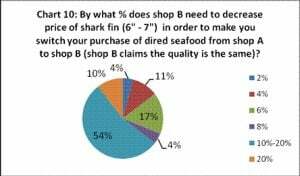 Chart 10 : Around 50% of the surveyed customers chose to switch their purchases when shop B decreases the price by 10-20%, which suggests that the XED of shark fin is quite low in different stores. 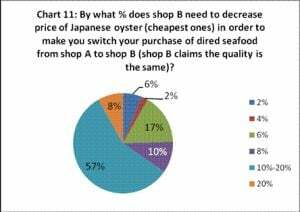 Chart 11 : Around 60% of the surveyed customers chose to switch their purchases from shop A to shop B when shop B decreases the price by 10-20%. This suggests that the XED of Japanese dried oyster is quite low. 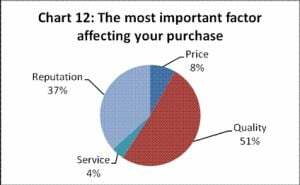 Chart 12 : 51% of the surveyed customers think that quality is the most important, followed by reputation. This might suggest that customers tend to go to stores with good reputation as they believe the quality in these shops would be higher. Meanwhile, only 8% thinks that price is important, which is low. This might be due to customers’ concept that cheaper dried seafood means lower quality. 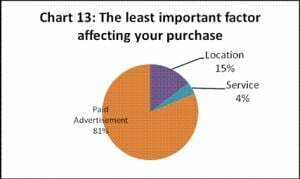 Chart 13 : The majority thinks that paid advertisement is the least important factor. Customers may not trust what is on the advertisement (“Word of mouth” is not included as it is not paid advertisment.). The shop owner says that the customers usually go to a shop by based on friends’ recommendations, so they do not care much about advertisement (See Appendix B). relatively inelastic XED. Cheaper products in one shop are not necessarily a close substitute of the same products in other shops. This is why the shop owners said that a price change would not change customers’ purchases. 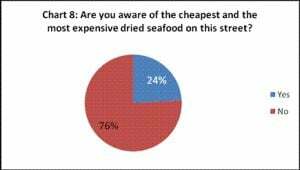 In addition, 76% of them are not sensitive to the price of dried seafood. This shows that customers do not have perfect knowledge. All of the above elements are features of monopolistic competition and oligopoly. 51% and 37% respectively think that quality and reputation are important, implying that customers would not shop in random shops, where quality is not guaranteed, unless they have a good reputation. 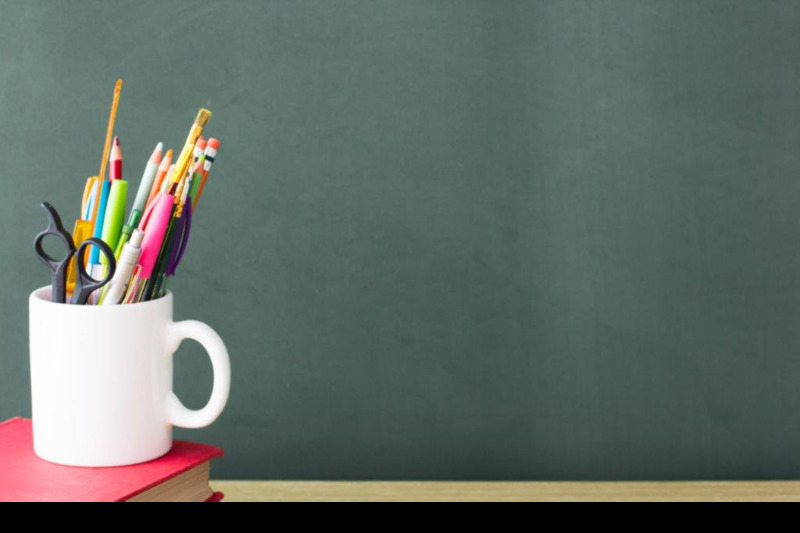 Meanwhile, 81% of customers considered paid advertisement to be the least important factor. So new entrants, who have no reputation at all, would find it hard to compete with old shops, which have a number of loyal customers, as it is ineffective for them to advertise and promote products to attract customers. This can be considered as a high barrier to entry and is supportive of oligopoly. Summing up, the customer survey has suggested that if a shop wants to attract customers, they would need to sell good quality dried seafood and have a good reputation. Eventually, this would win long-term customer loyalty. In addition, only 8% of the customers think price is influential. Such findings have suggested that non-price competition plays a large role in the industry. These elements are features of monopolistic competition and oligopoly. Such findings contradict the published report published as it states that price is a sensitive issue (Conover and Dong). The conclusion will first refer to the three hypotheses formulated. Hypothesis 1 states that the market is in perfect competition. This can be supported by the large number of firms in the market and the fact that no firm dominates the industry. Meanwhile, barriers to exit are low. However, these are also features of monopolistic competition. In fact, more evidence suggests that the market is in monopolistic competition. The price survey suggests that firms can alter prices, thus firms are price makers. The product survey indicates that products are slightly differentiated as the dried seafood in different shops can be of different qualities and from different countries. Customer loyalty also explains why the customer survey shows that customers do not acquire perfect knowledge of the market. The market shows features of oligopoly. Price collusion, as suggested by similar pricing and interviews with shop owners, between firms would be a significant piece of evidence. Because customer loyalty is associated with old shops, new firms can hardly attract any customers. This acts as a large barrier to entry. It also suggests that firms mainly rely on non-price competition. Referring to the data provided by the wholesaler and the interview with shop owners, it can be estimated and suggested that abnormal profit can be made in the long run. Hence, hypothesis 1 is mostly rejected. Hypothesis 2 states that customers are loyal to certain shops, but they shop according to price. Even though data shows that most customers are loyal to a shop, they would not change purchases according to price. Firstly, they are not very price sensitive due to their imperfect knowledge. Secondly, they also tend to visit shops with reasonable pricings as they fear lower prices mean the dried seafood is in low quality. Therefore, hypothesis 2 is partly accepted. Hypothesis 3 states that the main form of competition in the dried seafood market is price competition. Data shows that shops mainly depend on reputation to win customers’ loyalty. Price collusion has caused the price of dried seafood to be similar. Therefore, hypothesis 3 is rejected. Relating to the research question: ‘What is the market structure of the dried fish market in Sheung Wan?’, the dried seafood market resembles a monopolistically competitive market with characteristics of an oligopoly. Such a surprising result has demonstrated how theory would fail to explain a market in practice due to its complexity. 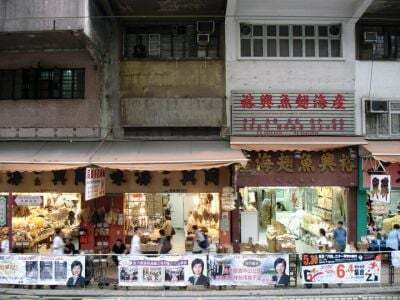 It is also amazing to see little information is published on how shops operate in dried seafood market, given that this street is a very famous street in Hong Kong. Almost all published information about this street is related to tourism. Even if there is a published report on it, it mismatches with some of the primary research data. If only secondary research is done, perhaps the collusive agreement on price would never be discovered. This emphasizes the significance of this report. 1. By 2012, the competition law will be imposed (SJ Berwin's EU & Competition Team), and shops will not be able to collude legally again. Will they compete more on price, or continue utilizing customer loyalty to attract customers? 2. From the data acquired from customer survey and interviews with shop owners, it is known that most of the customers are old. This suggests that young people do not buy dried seafood as much. In the future, if the older generation is gone, how will firms attract young customers and survive? 3. A new Mass Transit Railway station will be built and some exits will be built and opened on the street in the next few years (MTR Corporation Limited). This will possibly result in a large rise in rents. Developers will start buying old buildings for development of new buildings. This may force the street to move, or even disappear. Only 3 shop owners were willing to give interviews. In some occasions, one shop owner may have biased opinions. For example, Mr. Chan claimed that the market is very competitive while the others thought that competition was not very vigorous. If more shop owners can be interviewed, the extra information acquired can make data more reliable. The estimation of abnormal profit is based on Mr. Chan’s interview and the comparison of wholesale and retail price. To come to such conclusion, it is assumed that Mr. Chan has not exaggerated the level of profit and shops’ expenditures can always be covered by revenue. Therefore, the estimation of profit may be unreliable. If more time is provided, it may be possible to find a shop owner who is willing to show their financial reports, which would give a better idea as to what extent the dried seafood market is a profitable business. Due to time constraints, the price survey is only limited to five sample products, which is not large enough to represent prices of all products. Therefore, if more prices of products can be surveyed, it would further confirm whether there is a similarity in price. The estimation of low XED of products is based on a simulated price of the products, which is hypothetical. Therefore, it may not represent customers’ real reactions towards price changes. If time is allowed, it is better to wait and survey a change in quantity demanded in a shop after a price change to calculate the XED for the products. Finally, the area targeted is only part of the market. It may not fully represent the characteristics of the whole market. Blink, Jocelyn and Ian Dorton. “Perfect competition, Monopoly, Monopolistic competition, Oligopoly.” Economics. 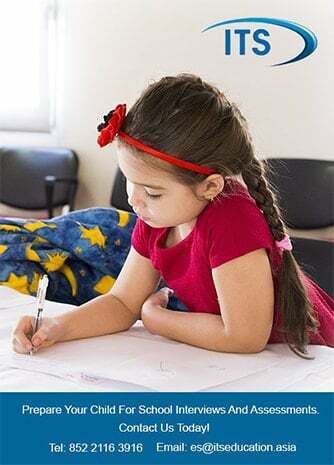 Great Britain: Oxford University Press, 2007. 95-119. Print. Conover, Shawneen A, and Dong Yuan-fang. "Hong Kong Dried Fish Market." National Marine Fisheries Service Mar. 1998. PDF File. Dobson, Stephen, and Susan Palfreman. “The competitive market mode, Imperfect Competition.” Introduction to Economics. New York: Oxford University Press, 1999. 85-107. Print. Dried Seafood Street Shops. 23 June 2010. Personal photograph by author. JPEG file. Hardwick, Philip, John Langmead, and Bahadur Khan. “Monopolistic Competition.” An Introduction to Modern Economics. 5th ed. 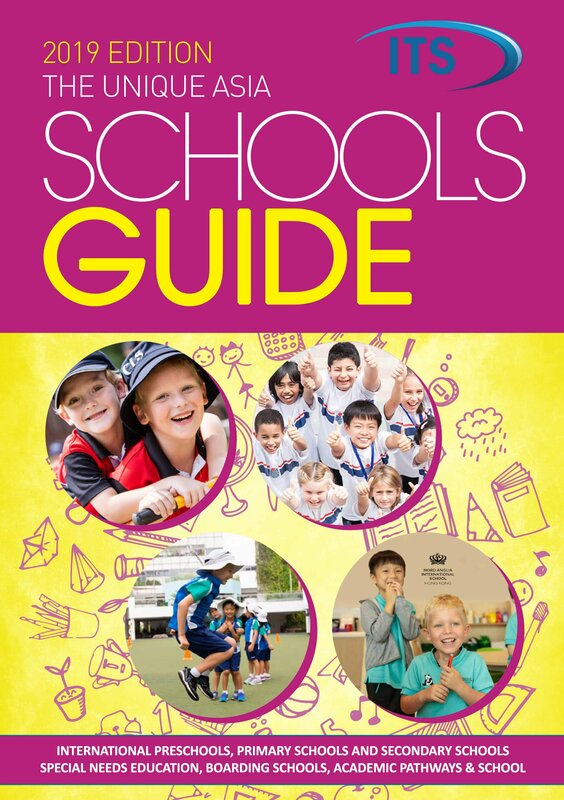 Singapore: Pearson Education Asia (Pte) Ltd, 1999. 204-205. Print. Hong Kong’s information Services Department. “Customs seizes fake abalone slices (with photos).” Press Release. The Government of Hong Kong, 11 Feb. 2010. Web. 15 July 2010. <http://www.info.gov.hk/‌gia/‌general/‌201002/‌11/‌P201002110187.htm>. Jiangxia, et al. “History.” Dried Seafood Street in Hong Kong. N.p., 10 May 2004. Web. 1 Oct. 2010. <http://jmsc.hku.hk/‌jmsc6030/‌video/‌sheungwan/‌history.html>. Mr. Chan. Personal interview. 23 June 2010. Mr. Shum. Personal interview. 23 June 2010. Ms. Chan. Personal interview. 23 June 2010. Management Consultancy Issues. Mondaq, 12 July 2010. Web. 1 Oct. 2010.